UNHCR’s Hasansham U2 camp opens for West Mosul displaced. Families arriving at the camp receive emergency household items – ready to move into their new tents. “The risk to people fleeing Mosul is now very great, with people having to move being in grave danger. People speak of conditions that are desperate and worsening. 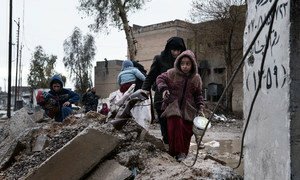 Families arriving from West Mosul report heavy bombing and fighting,” said a spokesperson for the Office of the UN High Commissioner for Refugees (UNHCR), Andrej Mahecic, today at the regular bi-weekly press briefing in Geneva. “They also tell UNHCR that there are no basic services in the city, no food, no water and no fuel. Some families have told us they have been living on one meal a day; often just bread, or flour and water, sometimes supplemented with tomato paste,” he continued. The newest camp was built in response to the ongoing Mosul emergency – less than four weeks since UNHCR opened the Hammam al-Alil 2 camp, with a capacity for 30,000 people, which is now almost full. Located approximately 60 kilometres west of Mosul along the highway to Erbil, first buses with newly displaced Iraqi families arrived at Hasansham U2 on Tuesday. As of this morning, 96 families, including some 500 children, are being sheltered in the new site. Each displaced family arriving at Hasansham U2 receives a tent and other basic aid items including blankets, a cooker and a kitchen set. As of today, more than 1,000 tents are ready, enough to shelter over 6,000 people. At full occupancy, it can accommodate more than 9,000 people. “UNHCR reiterates its call to all parties in the fighting to ensure civilians are not prevented from leaving areas of active conflict and are provided access to safe areas, including those currently trapped in Mosul. Equally, civilians must not be forced to return to unsafe areas,” underscored Mr. Mahecic. Six months into the Iraqi offensive to oust terrorists from Mosul, UNHCR remains concerned about the continuing massive displacement. Despite enormous risks, the number of people fleeing West Mosul shows no sign of slowing down. The UN refugee agency noted that its current humanitarian efforts to shelter and assist displaced Iraqi families and refugees who fled to Iraq were seriously challenged by waning funding support. “Our programmes in support of refugees and internally displaced in Iraq are currently only 18 per cent funded [$105.1 million received out of $578 million],” Mr. Mahecic pointed out. “This situation now threatens our ability to effectively respond to the immediate and mounting humanitarian needs in Iraq this year,” he added. According to Iraqi authorities more than 630,000 people have been displaced from Mosul and surrounding areas since October 2016, when the military operation began. This includes more than 434,000 displaced from western Mosul since mid-February. Meanwhile, an estimated 141,000 people have since returned to their areas of origin.